2019 Winner of the Home Media Award for Best Music/Performance. 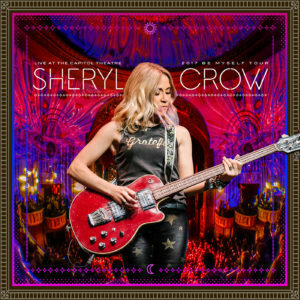 A spectacular DVD plus 2 CD set featuring 32x Grammy Nominee / 9 time Grammy Award Winner Sheryl Crow. This performance featured Sheryl with her all new band in top form performing new songs from her 8th studio album. Included are the Title Track “Be Myself” along with her newest hits “Halfway There” and “Atom Bomb “, as well as her classic hits including “Comon’ Comon” All I Wanna Do”, “Leaving Las Vegas “, “First Cut Is The Deepest”, Soak Up The Sun”, “If It Makes You Happy” and many more. The Film also features a vintage Black and White flashback introduction of many legends who have graced the Capitol Theatre stage over the years, interspersed with exclusive interview segments with Sheryl recently filmed at her Farm in Nashville.